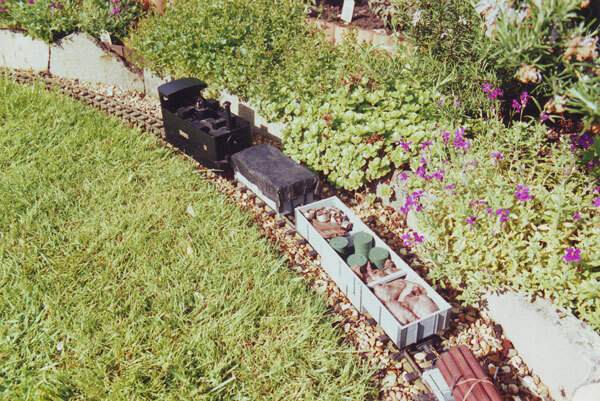 The Belfield Light Railway was a 16mm narrow gauge railway that ran around our garden. In fact, it was the construction of the railway that effectively shaped the garden we have now. 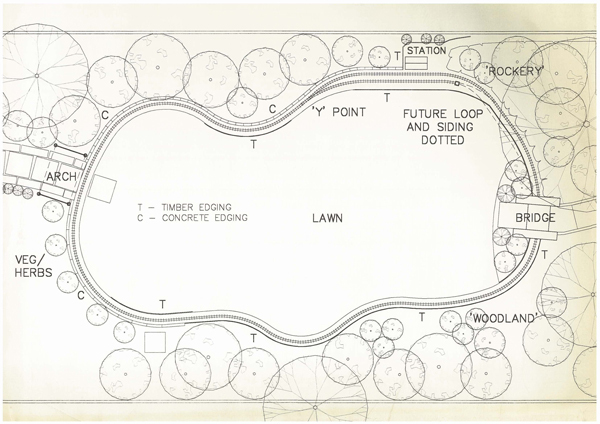 Instead of a single lawn with a step in the middle, the 'lower' and 'upper' areas were divided with a new archway and the railway formed around the lower area. 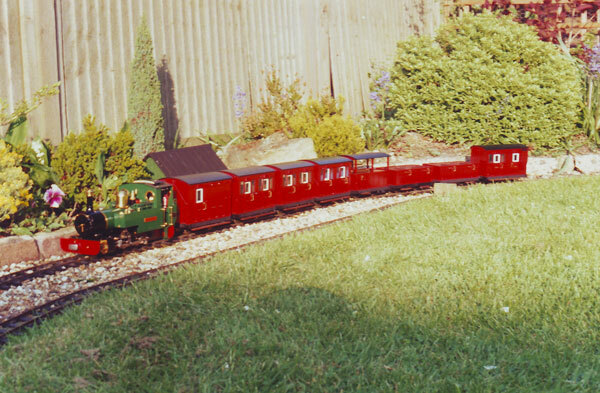 It was built during 1993-1994 and employed a construction technique that reflected the fact that a) it was a new venture and I wasn't sure I would stay in the scale and b) I didn't want to let it take over the garden, as many garden railways did. 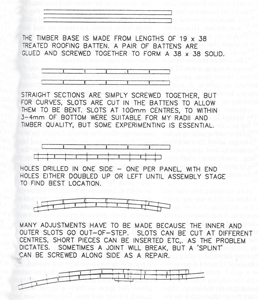 Instead of knee height heavy blockwork, brick or concrete walls, a discrete ground-level, gravel filled trench surrounded the lawn with the trackwork screwed down to treated timber battens 'floating' in the ballast. Trackwork was simple, with just a single passing loop at the station. The layout was 'written up' and appeared in 16mm Today - the magazine of the 16mm Narrow Gauge Association - in August 1994. A simple layout! 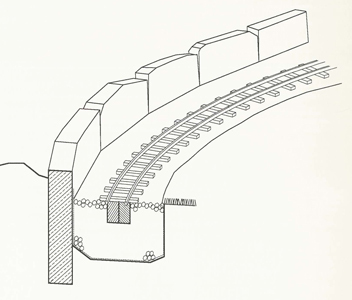 The loop was constructed and allowed two trains to be operated. A simple construction method! Treated timber battens in a gravel trench. The continuous battens provided super smooth running and lasted well except where soil washed into the trench and caused the timber to rot, but it took over 10 years! Lady Anne 'Christine' pulls a rake of scratchbuilt 4-wheeled coaches through the station. Scratch-built GVT tram loco and freelance, scratchbuilt wagons. The Lady Anne was a butane gas fired live steam, radio-controlled loco made by Roundhouse. The coaches were scratchbuilt using thin ply and stripwood with purchased wheelsets and axleboxes from Brandbright. Other loco's comprised a meths fired Mamod (rarely run) and several scrathbuilt battery electric locos. These included the GVT tram above, 'Derek' the diesel (all plasticard), a tram based on an Irish prototype (wooden body on a modified Lima class 33 diesel chassis) and an 0-6-0 diesel - a scratchbuilt metal chassis, but bodiless to date. All rolling stock was scratch-built (wood on proprietary wheels and bogies) and comprised the rake of coaches and a selection of open & bogie wagons & vans. By 2005, the track base was deteriorating and needed replacing, but I was spending less time running at home and more time down at the Guildford Model Engineering Society playing trains on their wonderful layout. A decision had to be made and in 2005 the track was taken up. It was interesting to build and fun to run, but it's time was over and it was taken up.